Sécheron Hasler Group’s modular, multifunctional REM102 energy meter integrates the Energy Calculation Function (ECF), Data Handling System (DHS) to generate Compiled Energy Billing Data (CEBD) and transfers the billing data via mobile communication to the ground-based Data Collection System (DCS). 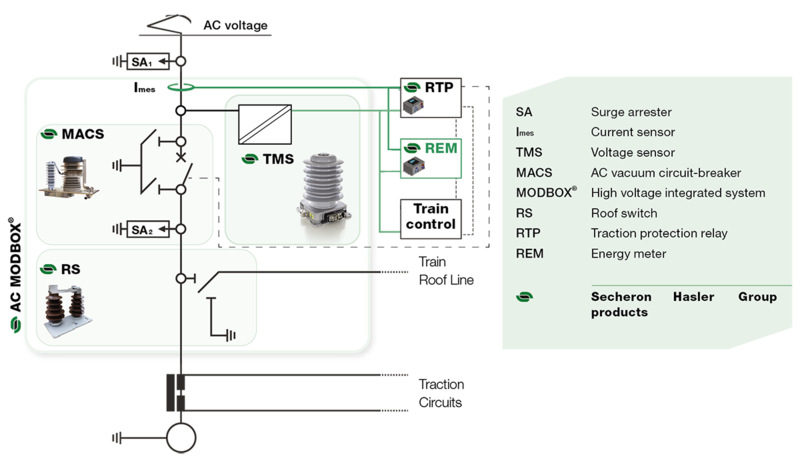 Sécheron Hasler Group’s REM102 multifunctional energy meter forms the cornerstone of our Energy Metering System (EMS) for rail vehicles operating on AC and/or DC networks. The REM102 is delivered with our AC circuit breaker and TMS voltage sensor, or with our DC circuit breaker and DC voltage and current sensors. The modular REM102 integrates the Energy Calculation Function (ECF) including energy consumed and regenerated computed from the current and voltage inputs. The Data Handling System (DHS) embedded in the REM102 generates and records Compiled Energy Billing Data (CEBD) from the energy data, time and vehicle location data coming from the integrated GPS receiver, and transfers the billing data via GSM-R/3G/4G or Wi-Fi to the ground-based Data Collection System (DCS). 3 optional digital NO outputs. Reference standards for energy metering EN50463. Certified according to TSI Loc&Pass.